South India is one of the top tourist destinations in India famous for its variety of culturally distinct and the visually energising landscapes. The region is blessed with unparalleled natural beauty and abundant culture. 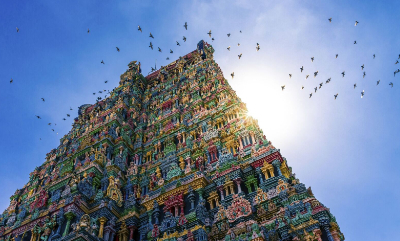 Wrapped in heritage richness, age-old traditions and rich culture, South India offers a unique experience to its guests. Tourists come here to explore the serene backwaters, exotic wildlife sanctuaries, laid-back atmosphere, beautiful hill stations, pristine beaches, evergreen forests, gushing waterfalls, ancient historical monuments and deep-rooted heritage. With so much to offer, South India is truly a treat for the sore eyes. South Indian states i.e. Karnataka, Tamil Nadu, Andhra Pradesh and Kerala showcase a perfect blend of traditions and modernity. The diverse land offers great opportunities to plan exciting tours from luxury to budget range. If you are looking for budget tour packages for South India, we at Intersight Tours offer you a wide range of options to choose from. Just let us know your preferences and we will create a perfect tailor-made itinerary for you suiting your preferences and pocket. Our aim is to plan and execute innovative as well as customised travel itineraries for you so as to derive maximum satisfaction and benefit from your travel experiences. Once you come to us, let loose yourself in exploring magical South India as we get your itinerary planned by our experienced travel specialists. Our exceptional services and experience in budget tour segment have made us the pioneers in the industry. We offer a range of experiential budget tour packages to domestic travellers such as culture and heritage tours, yoga and Ayurveda tours, community-oriented packages, culinary tours and backwater tours, to name a few. We believe in providing highly personalised and specialised services to our travellers so that they can have a memorable vacation and cherish it for a lifetime. We take care of everything right from the moment you step off from your flight. We arrange for your transfers, hotel accommodation, sightseeing, chauffeur-driven car and everything in between so that you have hassle-free travel experience. So come and experience our hospitality and give us a chance to serve you.